The fragile ceasefire announced on 21st November, following Israel's eight-day offensive on Gaza, was yet again violated by the Israeli military today after a fatal attack on a group of Palestinian civilians east of Jabalia. 19 year-old Anwar Al-Malouk, a law student from the Shajaia district of Gaza City was shot dead and 21 year-old Omar Wadi from the Jabalia refugee camp, north of Gaza City, was injured as he came to Anwar's aid. At about 2.30pm on 11th January, Omar was in a local cemetary visiting the graves of friends killed under the occupation. He noticed a group of around 30 Palestinians a few hundred metres away to the east, between the cemetary and the fence marking the eastern border of the Gaza Strip. From the cemetary, which was over half a kilometre from the border fence, Omar approached the group to investigate the situation. Four Israeli military jeeps were positioned on the other side of the fence and around 12 Israeli soldiers were present, firing tear-gas canisters towards the group of Palestinians. At this point, the group was at a distance of approximately 100 metres from the fence but then fled a further 100 metres back, amid the tear-gas attack. By around 4pm, Anwar had been separated from the group and remained alone about 40 metres from the fence, when he was shot by the soldiers and fell. Three of the group, including Omar, went back to assist Anwar. Omar says he acted instinctively at the sight of a fellow Palestinian in danger and didn't consider his own safety - despite not having previously known Anwar. As he arrived to where Anwar lay, he was hit in both legs by shrapnel from a hollow-tip bullet which exploded on impact with the ground nearby and showered metal fragments in his direction. The two others managed to evacuate Omar and Anwar from the scene to safety but Anwar had sustained a serious gunshot wound to his abdomen and died en route to hospital. Anwar had to be driven from the area to the main road in a toc-toc, where he was then transferred to an ambulance. Unfortunately, by this time he had already passed away in the toc-toc. 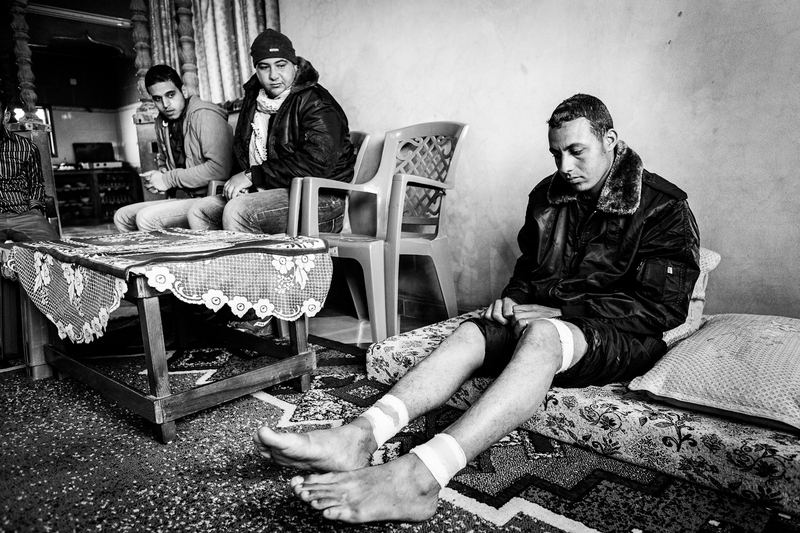 At Kamal Adwan Hospital in Jabalia, Omar was treated for ankle injuries. He has since been released but the shrapnel remains embedded in his bones. As an outpatient of the osteological department, he must return next week for assessment regarding the possibility of surgery to remove the shrapnel. It is understandable that Omar was terrified during the attack. He has been traumatised by the experience and has not been able to sleep due to reliving the memory of it. Omar has two brothers and six sisters. His 18 year-old brother, Mohammed, was seriously injured during an Israeli incursion in the east of Jabalia five years ago when he was only 13 years old. Mohammed underwent treatment in Egypt for four months and is still receiving treatment in Gaza to this day. The young mens' father expressed concern about Omar ever visiting the cemetary again, whilst their mother said she feared one day all her sons would be killed. The Wadi family yearn for a genuine ceasefire yet anticipated from the outset that Israel would never respect it. Omar's principal hope is that Israel's crimes against Palestinians will end. Anwar was the youngest son of the Al-Malouk family and the only one still living at home due to his older brothers being married. His 55 year-old mother hopes he is now at peace. The first Palestinian killed after the ceasefire announcement was also named Anwar. On 23rd November, just two days into the agreement, Anwar Qudieh was shot dead, this time in the rural area of Abassan, east of Khan Younis in the south of the Gaza Strip. There have been numerous Israeli attacks against Palestinian civilians in Gaza during the ceasefire. One can only imagine the response had it been the other way around.